If you’d like to address specific concerns with your skin then microneedling could be the answer. Dr Qian performs microneedling with a SkinPen – a small electrical device. Quick and precise, and giving better results than the dermaroller, microneedling is great for acne scarring, deeper lines and stretchmarks. Sterile micro-needles are inserted in to the skin using a SkinPen – a small electronic device. The micro-trauma created stimulates the skin to heal itself, creating a smoother appearance. When you visit the Skin Aesthetics clinic for your full 45-minute consultation, Dr Qian will discuss your medical history and skin concerns with you to assess whether this treatment is suitable for you. If it is appropriate, she will design a customised treatment plan which often involves combining microneedling with other treatments such as chemical peels to achieve the best results. 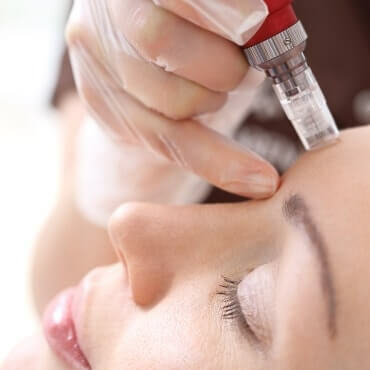 At your consultation you’ll be able to discuss microneedling and how it can help you, what to expect from the process and results, and how to care for your skin before and after the treatments. You will have the opportunity to discuss any questions you have. What happens at my microneedling session? Before treatment, a numbing cream is applied to your face which needs to stay on for at least 30 minutes. Dr Qian will then use the SkinPen in pre-determined areas, depending on the issue she is addressing. The actual treatment will take around 30 minutes. How does it feel to have microneedling? You will not feel any pain in most areas, but may feel some tingling sensations in some areas. What happens after my microneedling session? After your session your face will be quite red for a few hours. This will look like sunburn. You won’t be able to apply makeup for 24 hours, so you might not want to have this treatment during a working day. We will give you an aftercare leaflet to take home which will give you all the information you need about looking after your skin. After you’ve had your treatment your skin will be sensitive for several days. It’s really important that you protect it by wearing sunscreen (minimum 30SPF) for at least a week after the treatment. In the longer term it is important that you follow a good skin care routine. If you need some advice about this, or want some samples of our skincare products, please just ask Dr Qian when you see her. No, a numbing cream will be applied to your skin so the procedure will not be painful. How often can I have the procedure? You should wait at least 4 weeks between each treatment. However, for optimal results, you can have a chemical peel after two weeks. Can I have the treatment for acne? If you have active spots, then no. However, microneedling is great for acne scarring, especially if combined with chemical peels. Is this the same as the dermaroller? Dermaroller is a form of microneedling. However, it is more traumatic for the skin. The SkinPen has vertical needles that go in and out of the skin very fast. It stimulates the skin with the minimum amount of trauma.